Mei-Ling Tchii graduated from National Taiwan Normal University (NTNU), Taipei, Taiwan. She Studied Piano Performance in major and Vocal in minor in the Music Department. She was accepted to study in Musashino Academia Musicae in Tokyo, Japan before she decided to move to Salzburg, Austria. Later on, she continued her piano study with Prof. Igo Koch at Vienna City Conservatory of Music, Austria. After 3 years of studying in Europe, she then transferred to California and earned her two Master’s Degrees in Piano Performance and Piano Pedagogy with Suzuki Emphasis from Holy Names University. Before that, she had already completed and received the Teaching Certificate for the Suzuki Piano Method. Besides Prof. Koch, her teachers also include Kanamori Haruna, Ho-Hui Lin, Arlene Woehl and Roy Bogas. She taught at Catholic Hsiau-Min Girls’ Junior and Senior High School in Taiwan before going abroad. Since late 1980’s, she started to teach piano with Suzuki Method at Preparatory Music Department, Holy Names University. She also taught Suzuki Practicum at Music Department, HNU. By now, she has accumulated over 30 years of experience in piano teaching. Between 1997 and 2007, she served as Music Administrator for the Preparatory Music Department at Holy Names University. She and her husband, Kent Tchii run the Tchii’s Piano School of Music in Alameda. Mei-Ling is a member of Music Teachers’ Association of California, Suzuki Association of Americas and Suzuki Music Association of California, Bay Area Piano Branch. 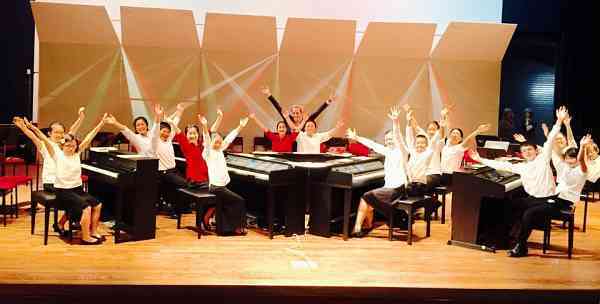 Her specialties include beginning to advanced level of piano method and ensemble repertoire. Because her father was a diplomat, Mei-Ling’s story of growing up is a like an adventurer’s storybook. She was born in Tainan, old capital of Formosa. She lived in Seoul, Korea during her elementary school years. During her junior and senior high school years, she lived in Tokyo, Japan. Although she wishes that she could still speak Korean and German, she does speak fluently in Mandarin, Taiwanese, Japanese and English. She enjoys different culture cuisines, gardening and traveling around the world.